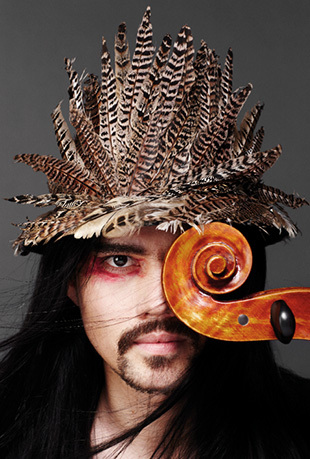 Avant-garde cellist, pianist, sound designer, fashion icon, and now cultural ambassador. Musician Ben Skepper is an artist of many hats (literally), among them being a bicultural Australian raised Melbourne by a Japanese mother and Aussie father who sometimes inhabits Tokyo. Metropolis heard from Skepper about his new album of field recordings, and his upcoming cultural mission to Russia. Why did you decide to base your new album around field recordings? In The Field is my fourth album, however, I present a different perspective on my work as a sound artist. This album is not instrumental, but rather an exploration of different sounds recorded around the world. Boiler rooms of a naval ships, Rom gypsy weddings, chanting in Roman Cathedrals, street life in Paris, environmental sounds from the forest in Australia, temple sounds in Kyoto, there are many different sound bites that I have captured. Back in recording studio, I separated all the files by country and then set about remixing field recordings into a multi-track recording. Italy, France, Turkey, Japan and Australia feature on this album, and each sound composition is designed as a “sound trip” into my sonic view of the landscapes of that country during my travels between 2006-2012. I hope that the sounds trigger visual images in the listener. How do you incorporate the recordings with your cello and piano performances? The field recordings form part of the live performance, interspersed between live instrumental compositions, and sometimes blurring into them. It is like a DJ mixing two tracks together, one is the live sound the other is the sounds of the field recordings. What did you learn about yourself and your travels in making the album? When we travel, we tend to capture a memory of a place or space on our iPhone. I see the world through sound, and while I love photography, to capture sounds from the places where I travel brings me back into that time space, triggers a memory. I rarely leave home without my sound recorder! Tell us about a few of the more intriguing field recordings you made. On the Turkish recording, when I was walking around Istanbul with my dear friend Aysu, we were suddenly invited into a Rom gypsy wedding party. People are very much scared of the Rom as they are often represented as thieves and criminals, however, we seized on this opportunity to join the fun, and I took a little recording of the live band and background chatter. It was a fantastic evening! The Italian field recording features many sounds taken on 11 March 2011, the day of the Tohoku disaster when I was supposed to fly back from Rome, but did not due to the disaster. That night I found myself on the Spanish Steps, in prayer, that friends, family and all in Japan would be safe. I captured a number of field recordings on this day as a memory of what happened even though I was outside Japan. Tell us about your role as an Australian cultural emissary to Russia. In July this year, I had my first tour of Russia. Alongside my work as an artist, I was also sent on a mission from the City of Melbourne to the City of St Petersburg with the intention of developing international intercultural exchange and to research the artistic landscape more generally. I met with some of the most prestigious Russian Public Arts Institutions, one of which was the State Conservatory of Music. I have now been invited back for a fellowship next year, which I am extremely excited about. I have always had a deep respect for the cultural history of Russia, and I now possess the chance to become part of its cultural fabric. Next year Melbourne and St Petersburg celebrate 25 years of sister city relations, and I have curatorial and collaborative performance plans in the pipeline. I intend to share my experiences as an artist with Russia, and to introduce Russian art and artists to the rest of the world. It is a big dream, which is coming into fruition. This entry was posted in album, international, interview, japan, music, tokyo by dangrunebaum. Bookmark the permalink.